Which character did you read first? Did you read the other characters in the order presented by the book, or did you jump around? Explain your reasoning. Which characters did you most empathize with? Likewise, which characters did you feel the least connected to? Why do you think that is? Who was your favorite? Each character had a diverse background before the zombie apocalypse started. How did this affect the types of decisions you were offered once placed in that characters shoes? Were some more or less prepared than others? Did that effect their chances of survival? 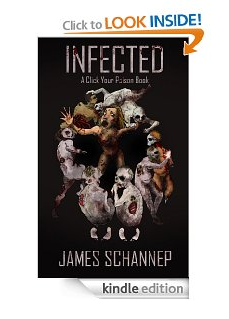 Did you read INFECTED before you read PATHOGENS? If so, did it change your viewpoints on the characters as new light was shed on their backgrounds? The group of “Preppers” known only by their tattoo Ad Vitam Paramus (which means “We are Preparing for Life”) were perhaps a little too prepared for the apocalypse—to the point where they were immediately ready to take advantage of a crack in societal structure. Do you think there really are people out there waiting to take advantage in the event of a societal collapse? The book is sometimes hilarious; sometimes disturbingly dark. How did you feel about this type of gallows humor? Was an appropriate balance struck between the two moods? By its very nature, Gilgazyme ® takes out the wealthy and influential first. Does this make an apocalyptic scenario worse (no world leaders)? Or better (salt of the earth people most likely to survive)? Discuss your reasoning. Were you able to fully immerse yourself as another person and think from their perspective? Or do you think you still made decisions as you yourself would? What does this say about our capacity for empathy? What served as the book’s most difficult obstacle? The zombies? The National Guardsmen? Or the roving bandits? What does this say about humanity and our ability to join together under a common threat? Share an experience in the story that really stuck with you. Perhaps a spot where you thought you were going to “lose” but didn’t, or a section that resonated with you for any reason. Discuss. Each character had to make sacrifices in the name of survival. Some literally had to sacrifice loved ones. Others their pride or sacrifices of character. Is it possible to go through a survival ordeal unchanged? Do you really survive if you “become” someone else as a part of that experience, for better or worse? This, more than any other of Schannep’s works, is a character study. His other three books leave you with a blank slate from which to experience the story world, while this book gives you a clearly defined character as your guide. How do these experiences differ? Which do you prefer? And, as a bonus, if there’s anything you’d like to ask the author, feel free to post it in the comment section below and I’ll get back to you! © James Schannep and jamesschannep.com, 2011-2016. Unauthorized use and/or duplication of this material without express and written permission from this blog’s author and/or owner is strictly prohibited. 2) Identify with Cooper,strong women who isn’t bothered by “The All Boys Club.” do not identify with Hefty and drug use and distribution. A junkie is going to relapse when the chips are down. 3)Yes, some were more skilled and adapted better than others.As Cooper She made a rookie mistake by stopping to help the people in the car crash and was bitten. 4) No but I want to read it. 5)Oh yes and much worse. 6)Yes and it was delightful. 7)Better,with the way things are today. 8)I think I still made some decisions based on my personality instead of Cooper’s background. 10)Having to paly nice with your abductors, till you have a chance to escape.Even when you just want to rip their heads off. 11)No one will come out of a devastating time the same as before. The ones who will survive are the ones who can adapt,and live with who they have become. We all will have to do things that threaten our sanity and the moral fabric of who we once were. 12) It is kinda nice to think outside of the reader’s nature and have to think what would this character do given her experiences. Bonus: This book has been a lot of fun,I am reading as a different character now. Thank you. Thanks for sharing your responses, that was a lot of fun to read!